Residential Bed Bug Management Company. It’s proven. It’s safe. It’s proactive. It’s discrete. It gets results. It’s our only business. It’s guaranteed. Canadian Bed Bug Solutions believes in doing one thing and doing it well. We focus exclusively on bed bugs. 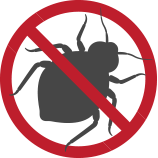 We know how to eliminate bed bugs quickly and efficiently. Canine bed bug detection and thermal elimination. Saskatchewan and Regina´s Premier Hospitality and Residential Bed Bug Management Company. Like most great ideas, Thermal Remediation® is simple. Bed bugs are attracted to heat – that’s how they find their food source. Enough heat will kill bed bugs, along with mold and all other insects. Heat kills bed bugs at all their life stages – eggs don’t survive, so they can’t hatch and cause repeat infestations. Heat is the solution. Our bed bug sniffing dogs are trained to the same exacting standards as canines used in law enforcement, medicine, health and public safety. Unlike a human inspection, which can take several hours and require moving furniture, a bed bug sniffing canine can cover a typical room in less than three minutes. Regular sweeps for bed bugs by trained and certified bed bug canine teams will greatly decrease the risk of population and ensure that the infestation will be found early.